I recently noticed that James Gosling moved his blog from sun’s site to his own blog with a cool domain name. Also, I noticed in his bio that he is unemployed. 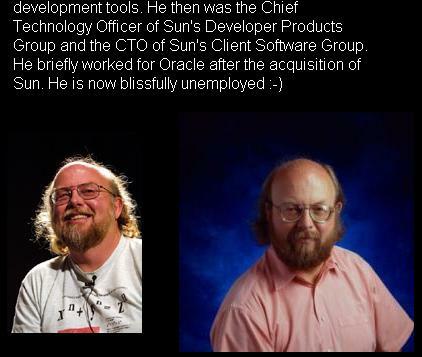 Yes, you read it right, James Gosling is unemployed! Oracle bought Sun some time back. We are all eagerly watching the events aftermath. I would say this as one of the huge blows. Though now java grows out of JSRs, he was the CTO of an important division. Of late his contributions to java as a language is debatable. But above all, he is James Gosling. He resigned on April 2nd. I am not aware of the happenings behind. He says, he is going to start ‘job hunting’. Don’t get emotionally attached with the product, technology and anything else with you are working on. Only knowledge is yours. Beware, if it could happen to JAG, it could happen to ‘anyone’! Comments on "JAG is Now Unemployed!" His April 9th, and April 17th blog entries talk quite a bit about his decision to move on – and the “challenges” of resigning from Oracle. Also, if you look at the blog entries from around that time you can find lots of thoughts on his resignation. Thanks David. He has revealed a very little. But looks like painful things have happened. But the cheese is moved and time to move on. Dr. Marc J. Hadley is the specification lead for JSR 311, a Java API for RESTful Web Services, and is author of the Web Application Description Language (WADL). You have no idea how obnoxious the “cheese has moved” meme is. Not to mention the fact that I don’t think the parable you intend to invoke is at all relevant in this case, as Mr. Gosling’s departure has more to do with politics than with his position being outsourced or the Java technology stack changing in ways that he didn’t like. Seriously, everything is there in Gosling’s blog, and in the public statements he’s made to the press. There’s no mystery here. I think Mr. Gosling has earned the right to take a break from Java for the near term. Maybe he’s happy not playing the kind of role he was playing in the last few years. Maybe he’ll do something radical and create a brand new language, or maybe he’ll start a Java consulting company. Who knows? His future is bright. But the cheese has most certainly NOT moved. It just grew mold and turned rancid, and Mr. Gosling could no longer stomach it, so he went elsewhere to find some better cheese. Rob Poole, first thing I didn’t intend any insult. I make my living using Java. Yes we know that Gosling is the father of java and I have great respect for him. Let me rephrase what I mean. Though Gosling resigned himself (he chose to resign), all these happened because of Oracle’s takeover. Which was not in his control and that’s where the cheese moved away fits in. Yes, he will do great things in future. Resigning from Oracle doesn’t mean that he has moved away from Java. Point is, factors that were out of his control forced him to take this decision. It doesn’t mean that he has lost something. But its other way around. Now he is employed to Google.. Like to see an updated post on this too. you have done very good job in a very understandable language for developer such as me. i hope u will not end this. Father is now employed with Liquid Robotics. Comments are closed for "JAG is Now Unemployed! ".